"I envy people who drink - at least they know what to blame everything on." Ingredients: 1 14-inch flour tortilla, 1 grilled chicken breast, diced, 2 oz. each - grated low fat mozzarella and cheddar cheeses, 1/2 red pepper, chopped, 1 Tbsp. chopped onion, 1 Tbsp. chopped scallions, 1 pinch taco seasoning or spicy seasoning salt. Recipe: Quesadilla is best made over a flat top grill. It can, also, be cooked in a cast iron pan, oven or over a B-B-Q; Place the diced chicken, pepper, scallions onion and seasoning on a greased flat top and saute them until the onion is golden brown. Remove the filling and put the tortilla on the flat top until it is lightly brown on the bottom side. Flip the tortilla on the other side and spread evenly the stuffing and the grated cheeses. Cook the quesadilla for about 5 minutes, then fold one half over the other in the form of half moon. Finish the quesadilla on the flat top until both sides are crispy, flipping it one or two times. Cut the quesadilla to 2 or 4 pieces and serve. 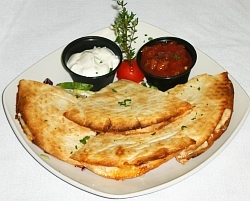 The quesadilla in the picture above looks like a smiling face, doesn't it?